Sea salt chocolate almond bark! Thin layer of toasted sliced almonds, coated in creamy dark chocolate and sprinkled with sea salt flakes. Crunchy, creamy, sweet, salty. This recipe from Sarah Bakes GlutenFree has all of these things! A sweet, salty, crunchy, chocolatey treat. 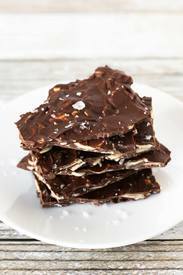 This sea salt chocolate almond bark would make a delicious gift for a friend or you could just store it in your fridge and keep it all to yourself. No judgement.